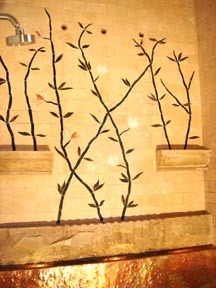 Custom tilework and mosaics for residential and commercial locations. Artisan Tile Worx (formerly Aquamosaics) specializes in custom mosaic tile installations, custom furniture, metal work and water features, as well as standard tile installations. Art, innovative design and fine craftsmanship characterize the work we're doing around Colorado. We work with marble, stone, granite, glass, ceramic tile and metals in both existing designs and new construction. Whether it's a mosaic entryway, a unique bath/shower remodel or a personal water feature in your home, Artisan Tile Worx creates exquisite, one of a kind pieces for a variety of locations. Our water features have a life of their own with soothing sounds, playful illuminating lights and rushing water. We create both freestanding movable fountains and custom water walls and our work can be installed inside or outside. View our portfolio to see how we've helped our clients make their own personal statements through the magic of stone, metal and water.